This blog entry describes how you would install and configure the TFTP (Trivial File Transfer Protocol) server for the purpose of building a PXE boot environment. 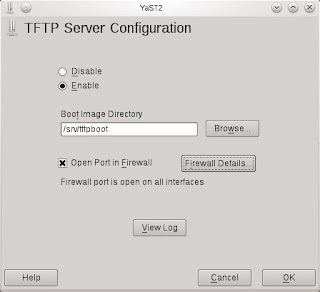 The tftp server would transfer the syslinux binaries to boot up your physical machine. It will also present a text-based menu for the user to select what operating system to install. Link to main entry on Network Installation of openSUSE. In TFTP Server Configuration dialog, check to Enable the service. Ensure the Boot Image Directory is set to /srv/tftpboot. 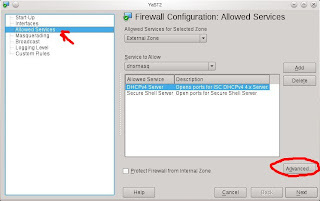 Finally, check the Open Port in Firewall and click Ok. 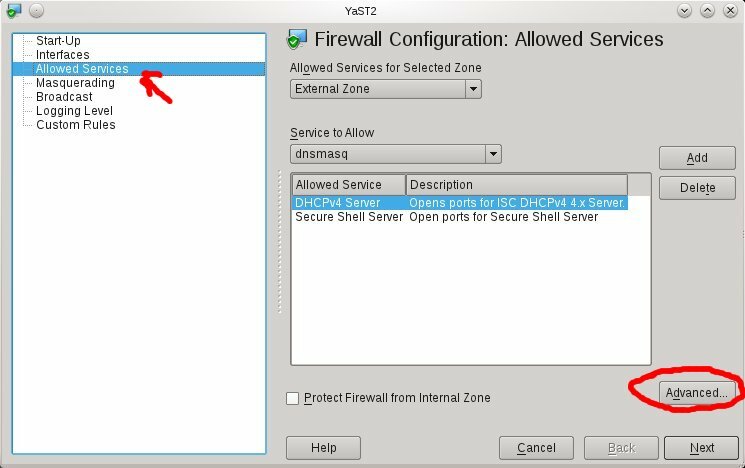 Note: Its been observed that the SUSE Firewall may still block incoming traffic to the TFTP boot server despite the Open Port in Firewall setting. 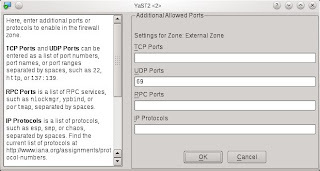 To ensure the Firewall is not blocking incoming TFTP traffic, open the Firewall setting via YaST (or command-line yast2 firewall). Navigate to the Allow Services section (left-hand pane) and click on Advanced button. 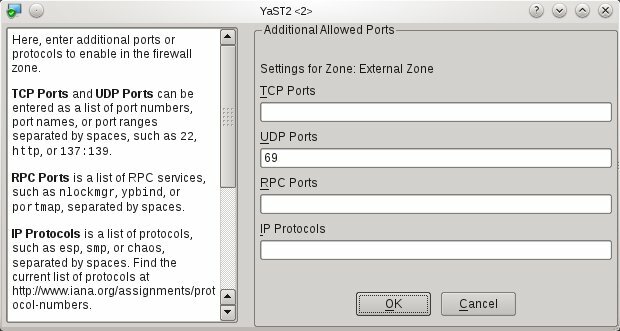 Ensure that port 69 is listed in the UDP section and click OK to accept. Click Next and complete the settings change. *You may unmount the ISOs as these copy are a one-time operation. Everything is self-explanatory above except for the install=http://IP_ADDRESS_OF_SERVER portion. Please refer to my other blog entry on using Apache2 webserver to host and serve up software binaries. Finally, edit the message file in step 4c earlier to correspond with the example default file entries. To start the installation, type one of the options below and press . Thanks. I'd been trying to setup a tftp server for over two hours now and never realized that it was a firewall issue.